After months-long legal battle and winning a judge’s ruling to block new admissions to a controversial adult care home in McDowell County, the N.C. Department of Health and Human Services reversed course last month and has said the 80-bed facility may take on new residents. The reversal came as a result of new inspections in February that found few problems at Cedarbrook Residential Center, public records show. This was a change from previous inspections in 2015 and 2017, which Cedarbrook has contested through the state’s administrative court system. Those earlier surveys showed alleged problems ranging from resident prostitution to residents forced to lie in their own waste. While the state offers facilities an internal means of appeal, Leonard has instead chosen to litigate. DHHS allegations about Cedarbrook in reports from November 2015 and follow-up inspections the next year resulted in more than $359,000 in total fines. This was by far the largest penalty DHHS levied against an adult care home during the period from 2014 to 2017, when the next largest totalled about $104,000, DHHS records show. The latest round of legal contention began after onsite surveys that health regulators from the state and the McDowell County Department of Social Services conducted in September and October 2017. Then, surveyors reported a long list of deficiencies that led DHHS to impose a ban on new admissions. Cedarbrook, however, appealed to the North Carolina Office of Administrative Hearings, a quasi-judicial agency. The suspension of admissions received immediate attention in November, when Administrative Law Judge Randall May granted a temporary stay to the suspension of admissions. Leonard testified in November that such a suspension would cause his business to lose money. May agreed. Based on the possibility of irreparable harm to Cedarbrook, the judge wanted to wait until he could hear detailed evidentiary testimony from both sides and determine the merits of their cases before allowing the suspension of admissions to go into effect. Subsequent hearings on the admissions issue took place over about 10 days in January in High Point and Greensboro, with a legal team from the North Carolina Department of Justice representing DHHS. Ultimately, Judge May ruled for the state on the merits of its case and signed an order permanently lifting his earlier stay, paving the way for DHHS to block admissions at Cedabrook. DHHS and the McDowell County Department of Social Services conducted a follow-up onsite visit at Cedarbrook that concluded Feb. 28. Then, surveyors from DHHS and McDowell DSS identified two deficiencies and issued a new Zero-Star rating. They did not note a recurrence of the many problems cited in the October report that led DHHS to suspend admissions, records show. 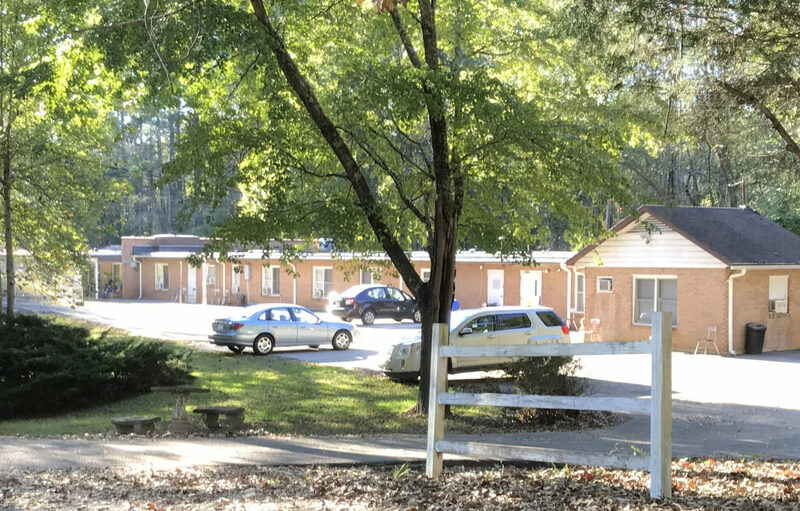 “Based on the information and recommendation reported by our staff and the McDowell County Department of Social Services from the survey of 02/28/2018, we find Cedarbrook Residential Center has made progress towards substantial compliance with the rules for the licensing of Adult Care Homes,” wrote Meghan Lamphere, section chief for Adult Care Licensure at DHHS’s Division of Health Service Regulation, in a March 1 certified letter to Leonard. Leonard criticized DHHS’s handling of the situation since October and continues to challenge legally the findings in the October 2017 statements of deficiencies. Kelly Haight, a spokesperson for DHHS, defended the agency’s action on Thursday. “Based on conditions identified during our survey on Oct. 2, 2017, the department acted correctly to suspend admissions to Cedarbrook,” Haight said. The Statement of Deficiencies listing problems regulators identified at Cedarbrook during the February inspection came in at 17 pages, well below the 189-page report issued in October. In the statement, surveyors said Cedarbrook was not assuring referrals and follow-ups to meet the routine and acute health care needs of residents, based on problems cited in one of five interviews with patients. It also said Cedarbrook staff had not been appropriately documenting their monitoring of the patient due in part to confusion about what physicians had ordered. Surveyors also said Cedarbrook was not in full compliance with a regulation requiring that all 60 residents then at the facility receive a full complement of silverware at meals. Some Cedarbrook staff members described concerns about some residents with mental illnesses trying to attack others with knives and forks, according to the DHHS report. These findings were different from the types of violations that surveyors cited in October. Those included foul-smelling rooms, cracked ceilings, flooding, dirty floors and walls. Sheets in one room showed evidence of stains from human waste, surveyors reported in the October Statement of Deficiencies, saying a resident described having no choice but to lie in the filth. Among the most serious citations alleged in October was lax or improper supervision of residents, with one resident swallowing hand sanitizer and another eating from the trash. Some residents reported that Cedarbrook staff had threatened them with weapons. Surveyors said Cedarbrook had not always maintained adequate staffing. The case is being transferred to Judge David Sutton, who is based at the Office of Administrative Hearings’ Waynesville location. Sutton presided over previous litigation between the same parties, Cedarbrook and DHHS, regarding similar issues from 2015 to 2017, which resulted in a settlement generally favorable to Cedarbrook, though neither party admitted wrongdoing. The date of the next hearing has not yet been set, according to Ginger Barnes, Judge Sutton’s paralegal. Frank Taylor is the managing editor of Carolina Public Press. Contact him at ftaylor@carolinapublicpress.org.